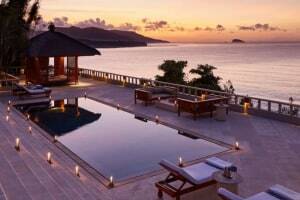 Nestled away in the tropical lands of Manggis and shaded with palm trees, Amankila is a quintessential haven. Hanging over the edge of coastline, its bedecked with the sweeping views of Lombok Strait and admire the crystal clear turquoise waters under the transforming Bali skies. Infused with the traditional architecture of thatched roofs and the scent of frangipani, the hotel offers sophisticated suites and the glorious three-tier pool that cascades similar to the rice terraces. 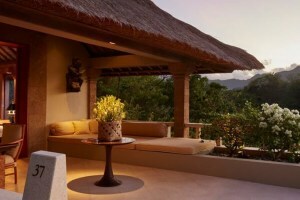 The suites are connected by walkways that sprawl through the reception, restaurant and the bar with majestic Mount Agung in its backdrop. Offering the best views of the vast vistas of ocean, the restaurant boasts traditional Balinese cuisine. The ingredients are locally sourced from the in-house Amankila garden for that extra touch of authenticity. It infuses local techniques with the contemporary style of cooking and sprinkled with oodles of flavours that will keep you asking for more. If you have any dietary restrictions, kindly let the staff know of it. 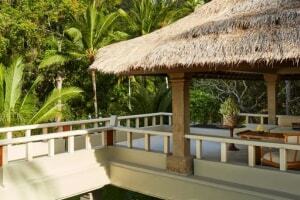 Inspired by the traditions of East Bali, the Spa at Amankila promises you complete relaxation in the lap of nature. 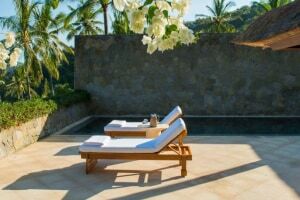 It uses natural ingredients while the treatment ranges from traditional Balinese baths, scrubs and wraps along the massage pavilion, beach bale or amidst a secluded open-air tropical canopy. Kindly arrive at least fifteen minutes before your scheduled time. Amankila welcomes young ones of all ages, however, pets are not allowed. Housing its own private beach make sure to carry a pair of sturdy sandals to get you along the beach. No check-ins or check-outs are allowed on Nyepi Day (Day of Silence) which is usually held in the month of March. Stays are still possible although guests are confined to the resort grounds, and requested to keep noise to a minimum out of respect for this religious celebration. Ngurah Rai International Airport will be closed, motor vehicles are allowed on the streets only for emergencies.